Thunderbolt 3 equipped devices now use the slim, reversible USB-C connector. 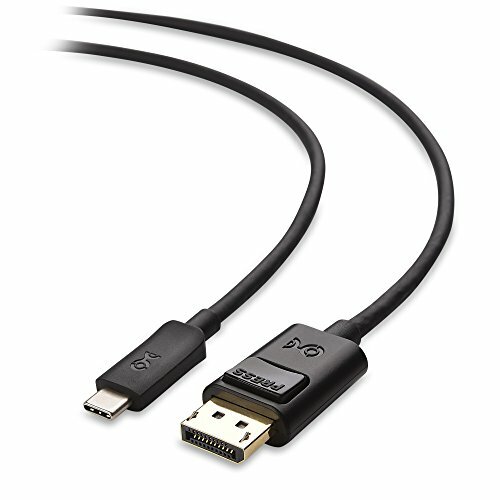 Compatible computers with a Thunderbolt 3 port can use this cable. USB-C to DisplayPort cable directly connects a computer with a USB C port to a monitor or projector with DP input; Low-profile and reversible USB Type-C connector clicks into place on your device and latches on the DP connector provide a snug and secure connection to the display monitor. 4K UHD DISPLAYPORT video resolution support for ultra high definition resolutions up to 4K x 2K (3840 x 2160) @ 60Hz; USB C to DisplayPort Supports Multi-Stream (MST) for daisy chaining multiple monitors and high precision 7.1 Surround Sound audio.